Gather your iPhone and email contacts and combine them with your Facebook, LinkedIn, Foursquare, and Twitter contacts in the easily customized Brewster iPhone and iPod touch app. You no longer need to open and close iOS apps and scroll through different contact lists to find a contact’s information. The Brewster iPhone app’s cohesive productivity tools allow you to search all of your contacts, catch up on pertinent details, and communicate with them through its interface. As with any iOS app requiring multiple authorizations to maximize the experience, you will spend a bit of time getting started. You sign into the Brewster iPhone app with your Facebook or Twitter account. You obtain a Brewster account name and add an email. After you have completed the authorization, you move to a cool graphic list of social networks and your online email browser to sync contacts. Your iPhone contacts are added too. There is a bold green plus next to each social network that becomes a gray check when authorized. When you have authorized as many social networks as you would like, Brewster’s iPhone app builds your account while you get back to your life. It took just two or three minutes for my list to build with a combined contact list of nearly 1,400. When your Brewster iPhone app contact list is complete, the next step is to establish your favorites list from a matrix of thumbnail photos and names. You use responsive gesture controls to scroll vertically through your list. Your family is grouped at the top of the feed, and your most active social network contacts follow. You tap each contact’s photo to add it to the list. The Brewster iPhone app includes the time-saving tool of tapping multiple photos to create a list. A cool feature for the favorites list–and all lists–is the ability to organize by gesture controls. You touch a photo, then drag to reorder your list. This functionality is similar to moving iOS app icons on your iPhone screen to reorganize them. After you create your favorites list, you finally find the Brewster iPhone app home screen. By taps on the appropriate icons on the menu bar at the bottom of the screen, you navigate between favorites, updates, search, lists, and yourself. Your favorites list can be sorted by favorites or the most recent contacts you communicated with through the Brewster iPhone app. The updates feed loads slowly, but the Pinterest style feed is attractive. You’re notified of major life changes and events, like birthdays. For each contact, you touch it to access contact details. 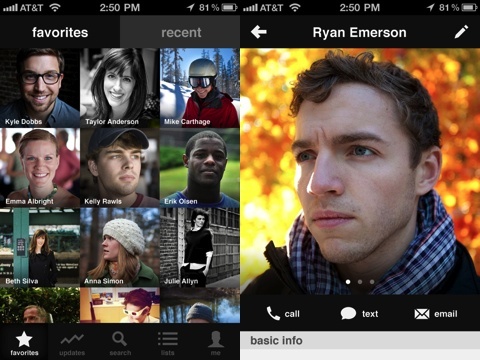 Your contact’s photo boldly fills the top of the contact form, or, for those contacts with whom you are connected in multiple social networks, you can scroll through multiple profile photos with horizontal finger swipes. Just below the profile photo, you can call, text, or email with one touch if that information is available. Finally, a list of basic information including work, schools, current city, phone numbers, and email is included. If multiple schools are available, you can expand that field by touching the arrow on the right side of the screen. At the top of the screen is a pencil icon, so you can add a contact to a list, favorite it, tag it, or add custom fields to enhance the information. You can merge multiple contacts with a touch. If your college friend uses her married name on her Facebook profile and her maiden name on her LinkedIn profile, then you can combine the information into one contact for increased efficiency. The ability to tag your contacts enhances the search feature. 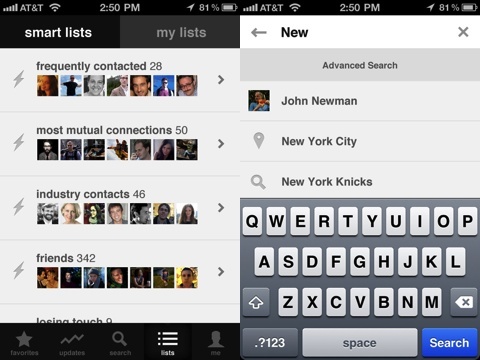 Brewster’s iPhone app creates suggested searches based on common threads in your social networks i.e. a city where many contacts live or profession. You can search for a person, place, or thing by typing into the search bar. Brewster’s iPhone app also includes “smart lists” tying together common threads like friends, common industry, and current city. The searches and lists are revealing and interesting, but after a bit of reflection they made sense. I know lots of lawyers, and I know loads of people in Atlanta even though I haven’t traveled to Atlanta in ten years. The Brewster iPhone app synthesizes literally thousands of pieces of information and distills them beautifully to simplify your life, enhance your professional life, and provide a fresh perspective. AppSafari review of Brewster was written by Jenni Ward on July 20th, 2012 and categorized under App Store, Contacts, Free, Productivity, Utilities. Page viewed 5758 times, 2 so far today. Need help on using these apps? Please read the Help Page. I installed this app after the glowing reports and reviews and it totally destroyed my contacts across 3 google accounts and iphone account. It duplicated contacts and then when support tried to merge them data got even more scrambled. I finally had to export and delete thousands of contacts and lost over 50% of my contacts built up over years. I am normally a big fan of this type of contact management across devices – but be very careful about using brewster across google accounts.